Anointing with fragrant oil is one of the oldest traditions in the Bible. 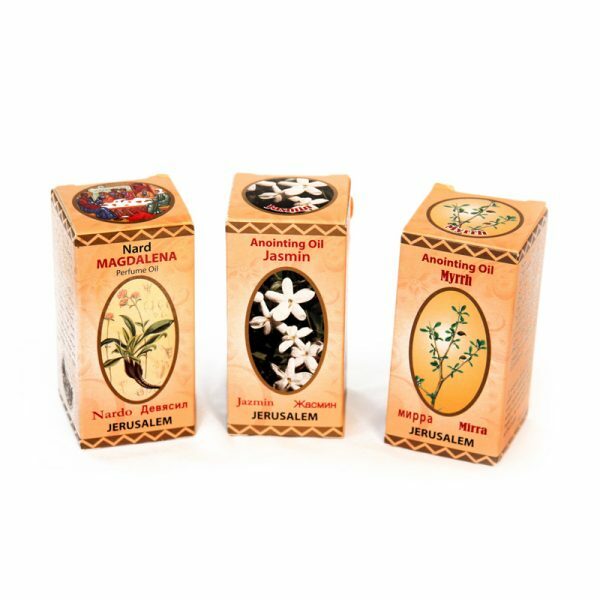 This fragrant Jasmine scented oil is made by local perfumers using virgin olive oil from the regions of Galilee, Bethlehem, and Jerusalem. Traditional fragrances include myrrh (one of the gifts the magi gave to to the Christ child), and nard (with which which Mary Magdalene anointed Jesus). Both of these fragrances are presented in a sweet concentration, making them appropriate for perfume or for anointing people in prayer. For those who prefer a floral scent, we also offer Rose and Jasmine, both of which grow throughout this land. The anointing oil comes in a small, decorative, plastic bottle which comes in a small box.